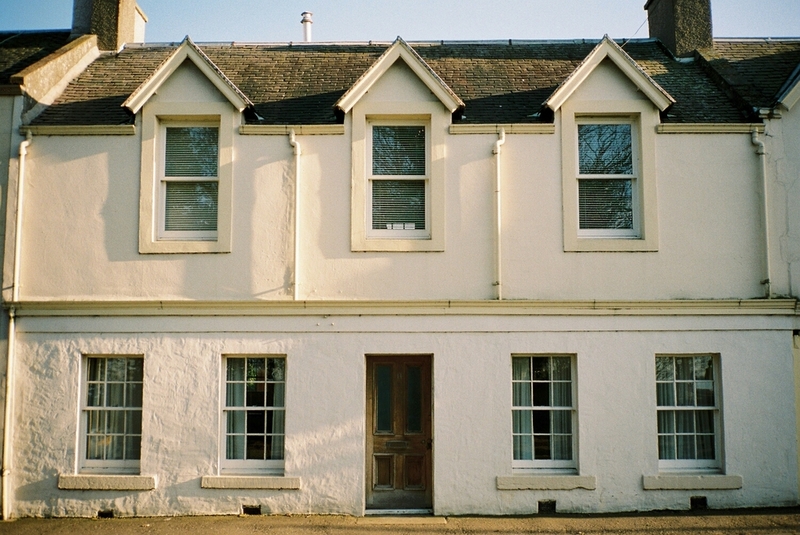 In February my Mum, Dad and I went through to Pittenweem in Fife for a day out. The weather was perfect to showcase the beautiful and colourful homes of the village, so I hope you like pictures of houses, as you'll be seeing a lot of them in this post! If you ever get the chance, I highly recommend a visit as it's easily one of the nicest wee towns I've been to. Part 1 contains my medium format shots from the day and were taken with my Mamiya 7ii and 65mm f/4 lens. Film used was a mix of Kodak Ektar 100 and Fuji 400H, but mostly Ektar. Thanks as always to Canadian Film Lab for the amazing job they do with my film. This is Jill. I got talking to her when she was taking a break from walking her dog. She instantly recognised my cameras as being film cameras and told me that her husband was a photographer in the Royal Air Force. She also said that he switched to digital when it came around but continued to shoot film for his personal work, which is something quite a few people still do today. I'm glad I asked to take her picture as it's nice to be able to remember such a pleasant stranger. A dreich day down at Dunbar Harbour with Craig sometime last year. The first image is my favourite from this day. I think this was either a father/daughter or a grandfather/granddaughter and he was pointing out the different sights to her. I have a print of this on Kodak Metallic paper and it looks really nice. The camera used was my Olympus Mju II and the film was Kodak Portra 400.
i thought these rocks were really cool so I snapped a quick portrait of Craig. 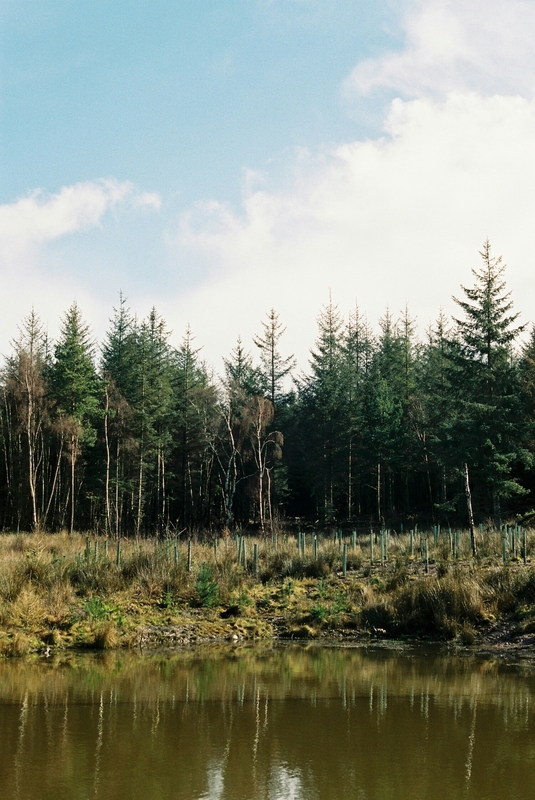 Oh, and here's some bonus panoramic shots from my Hasselblad Xpan also on Kodak Portra 400. Two seals swam into the harbour and I managed to get a photo of one of them, not the greatest picture ever but I had to take one! The Hasselblad Xpan is a tremendous camera and one that I had wanted for a long time, so when one came up for a ridiculously low price I jumped on it immediately. 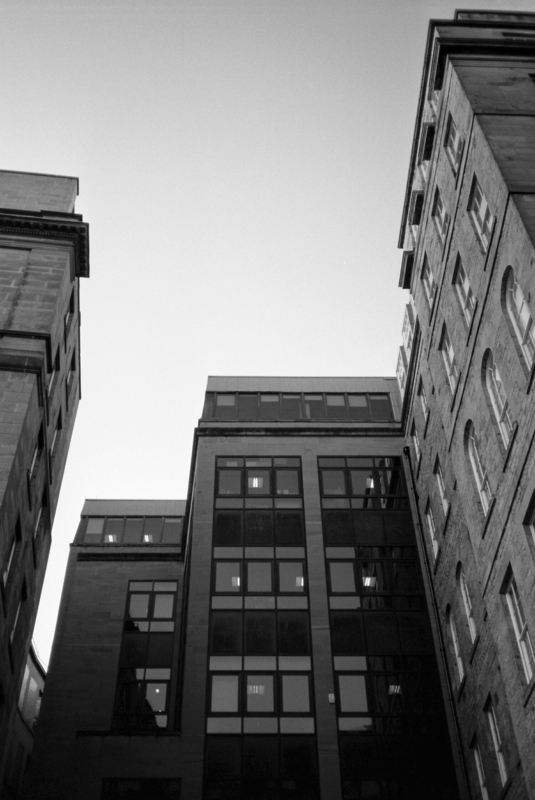 For those who don't know the Xpan shoots in a panoramic aspect ratio using two frames of 35mm film together. Sure, most phones can do panoramas these days but that involves the stitching together of multiple images which brings with it problems such as warping and distortion, not to mention it makes capturing a scene with movement impossible since each picture is being taken at a different time. That's the beauty of the Xpan, it shoots true panoramas all with the ease of use of a rangefinder camera so you can capture a panoramic scene exactly as it looked. 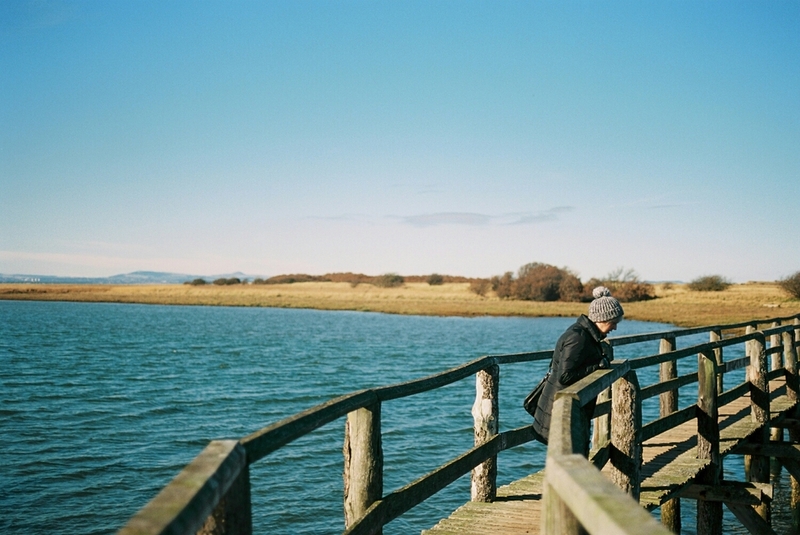 Anyway, enough technical talk, here's some pictures I took on my first trip out with the Xpan when my friend Kelly and I went for a walk along the Musselburgh Lagoons. A selection of images from a walk along Musselburgh Harbour on a misty day. All shots were taken with my Olympus Mju II and Fuji C200 film except for the last three which were with my Mamiya 7ii and Kodak Ektar. Development and scanning by the lovely folks at Canadian Film Lab. 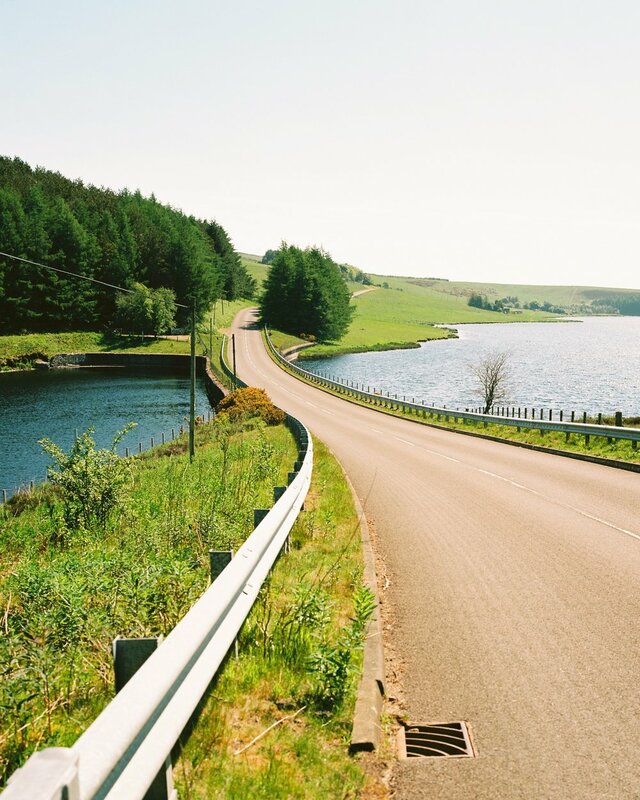 Early one morning back in June of last year I took a drive up to Whiteadder Reservoir. 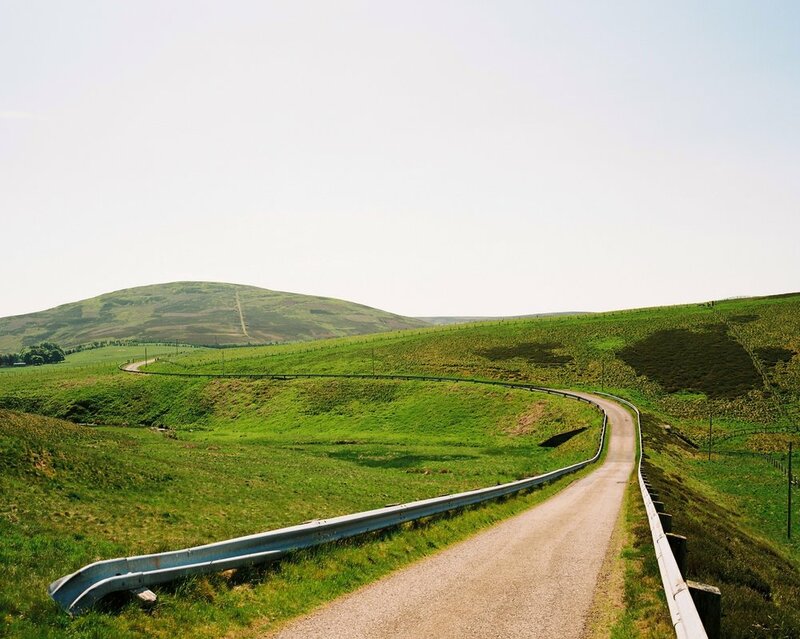 It's a lovely piece of land situated in the Lammermuir Hills. I remember going there with my Mum, Dad and sister when I was young and back then the drive seemed to take hours. In reality it's only about half an hour away and the drive itself is a nice one. On this particular day there was no one there except for a couple of fisherman, and when it's this quiet it really is quite idyllic. All colour shots taken with my Mamiya 7ii and Kodak Ektar. All black and white with my Mamiya 645 Pro and Ilford HP5+. Development and scanning by Canadian Film Lab. After visiting Gosford Estate earlier in the day we took a drive along to Seacliff Beach, a private beach near North Berwick. Apparently, I had been here before when I was little but I have no memory of it. It's a very nice secluded place and good for a quiet stroll. I loved the wispy clouds and the patterns on the sand. I seem to like taking pictures of Bass Rock but it's not my fault, it's visible from so many places! Unfortunately, it wasn't focused very well but I like it nonetheless. The lighthouse is way too small in the frame for this composition but it was the water on the sand mimicking the clouds that caught my eye. After a walk on the beach we set out to find Seacliff House. From the beach it isn't immediately clear where it is, as it isn't very visible. The following pictures are some of the things that we saw during our search for the house. Seacliff House was built in 1750 by Robert Colt. 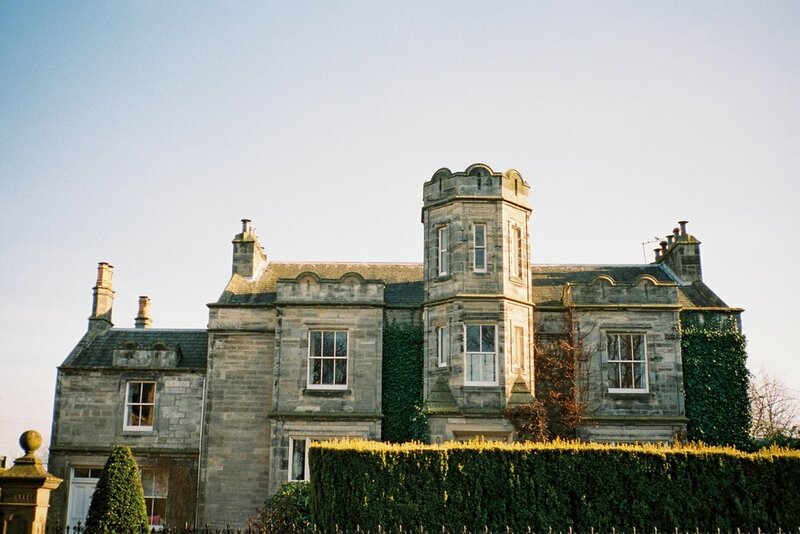 It was later bought by George Sligo who in 1841 employed the Scottish architect David Bryce to build a new house in a typically Victorian baronial style around the core of the older house. However, in 1907 it was gutted by fire. The exterior survives almost complete with gables, turrets and bartizans. The outbuildings were later purchased by the Royal Navy who established a top-secret research base there during World War I. The station, known as HMS Scottish Seacliff, was mainly used for navigation training and U-Boat defence. 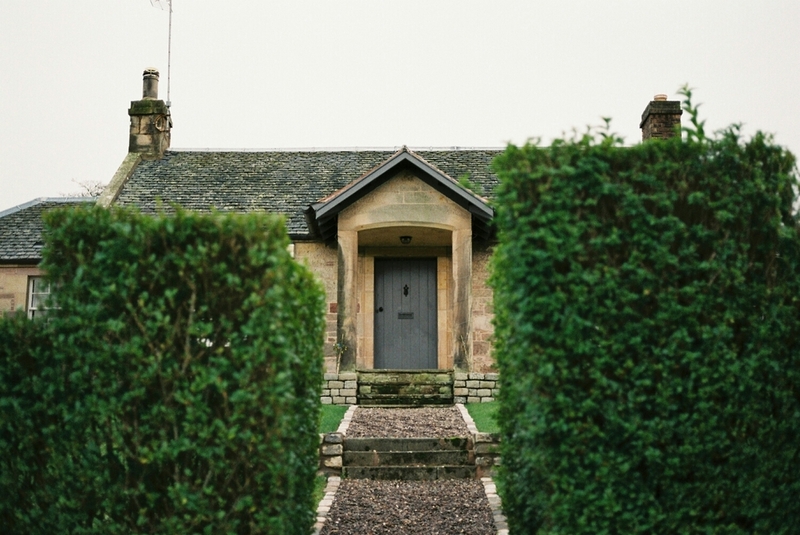 These days the house has been reclaimed by nature and the exterior is covered in ivy. The light was fading fast and we had to leave before they closed access to the area (it's a private beach and area) so I didn't manage to take as many pictures as I would have liked. However, it was still well worth the visit. There's just something about places like this that fascinate me. Once owned by people, now owned by nothing but nature. Gives me a sort of post-apocalyptic feeling. All images taken with my Contax G2 and Portra 400 except for the last three which were taken with my Mamiya 7ii and Fuji 400H. Developed and scanned by the amazing Canadian Film Lab. Sometime last year I went for a walk around Gosford Estate with my Mum. It's a really lovely place to go for a walk on a nice day, so I'd recommend doing so if you ever get the chance. Unfortunately, access to the ponds was closed due to flooding when we were there, so I'd quite like to back one day to have a wander around that area. 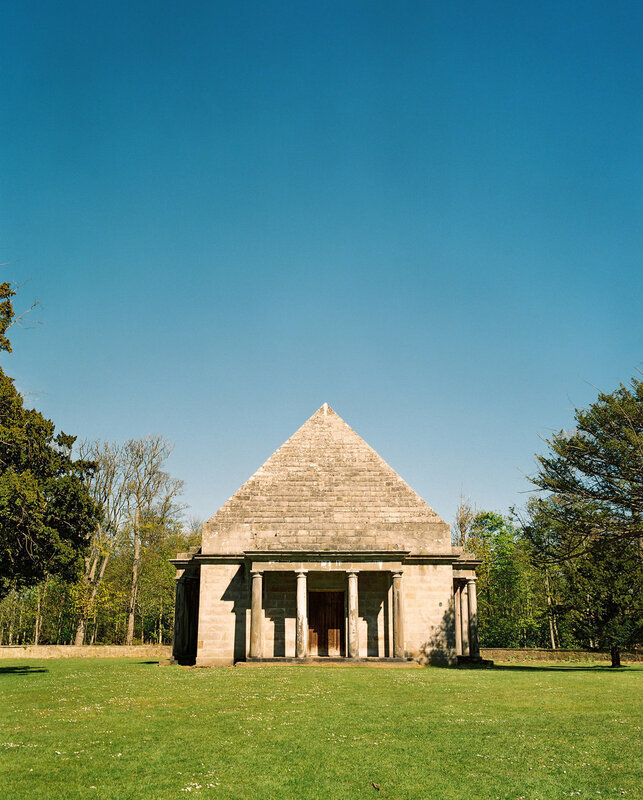 This first image is of Wemyss Mausoleum. It was built to be the burial place for the 7th Earl of Wemyss and his family but only the Earl himself ended up being buried inside. I don't usually post multiple pictures of the same thing but I thought it was worthwhile in this instance, so here's a few different views of the Mausoleum. 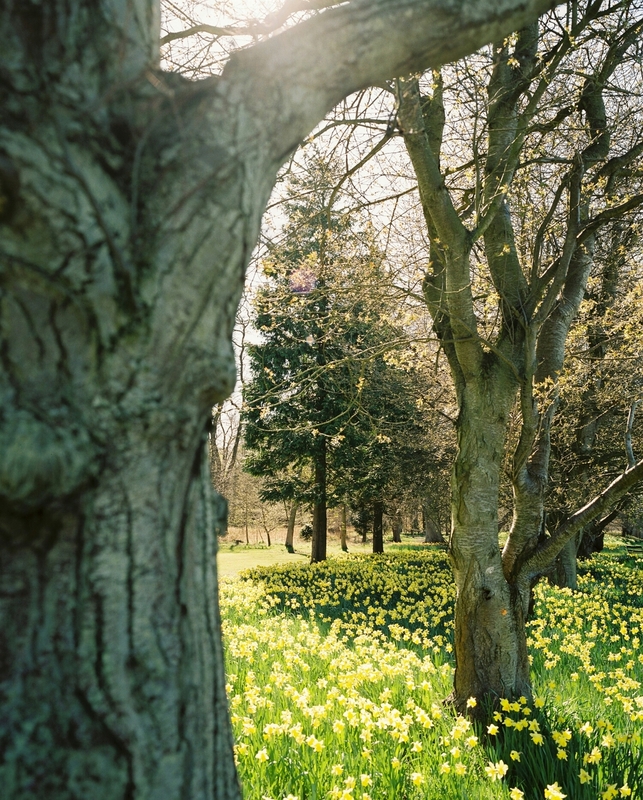 My Mum loves daffodils, so when she saw this little area in Gosford Estate she asked me to take her picture and I'm glad she did as I think it turned out beautifully. It's really the first time I've taken a proper portrait since I started shooting film, sure I've taken the odd quick picture of people, but I haven't really taken my time with one nor have I went out with the sole purpose of shooting portraits. Hopefully that's something I can do soon. One of the main attractions of Gosford Estate is its beautiful Neoclassical mansion. Gosford House was constructed for the 7th Earl of Wemyss and designed by Scottish architect Robert Adam. It was completed in the year 1800. Thought this rundown old tractor was really cool. I had no idea until afterwards that my two friends Kelly and Lee lived in the next two houses pictured. Quite nice to accidentally get a little glimpse into people's pasts. The next three images would have been perfect together had I taken them all from exactly the same perspective, but I wasn't thinking about that at the time. Nonetheless, I still really like how each turned out. They were taken along a stretch of what I assume is garages/storage and I just picked out the parts I found pleasing to the eye. All images were taken with my Mamiya 7ii and Fuji 400H. 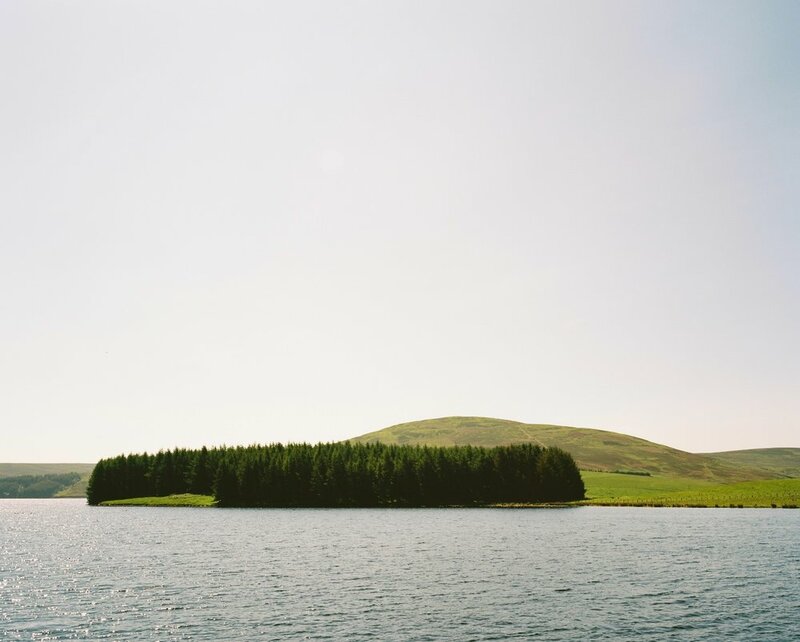 The day after wandering around Saltoun Woods, Craig and I went for a little jaunt around The Pentlands. 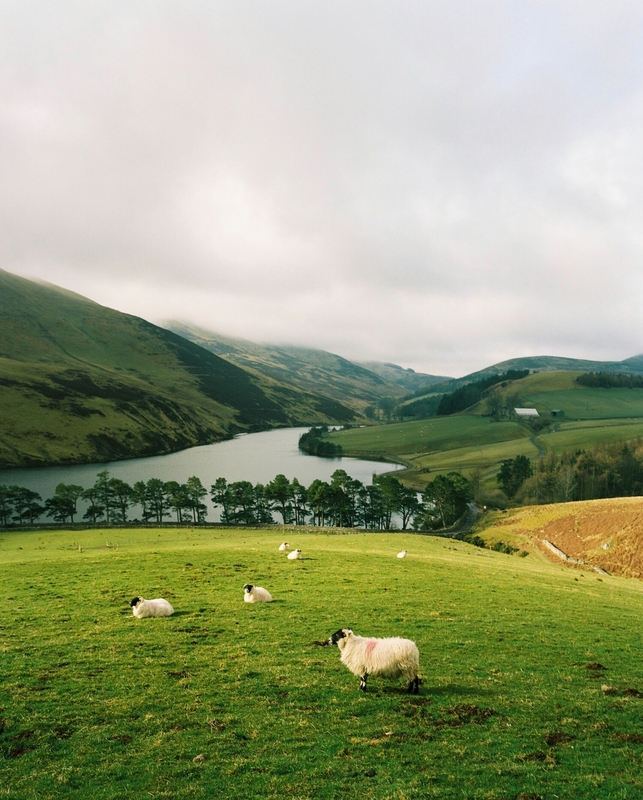 We would eventually climb Scald Law, which is the highest hill in The Pentlands, but we walked around a bit beforehand and found a really great vantage point of Glencourse Reservoir where I managed to get some nice shots. All pictures made with my Mamiya 7ii and 65mm lens. Film stocks used were Portra 400 and Delta 400. This one was taken just a little bit along from the previous shot but I wanted to include it because of the sheep and the lovely streak of sunlight. I was really happy with how these black and white shots turned out. 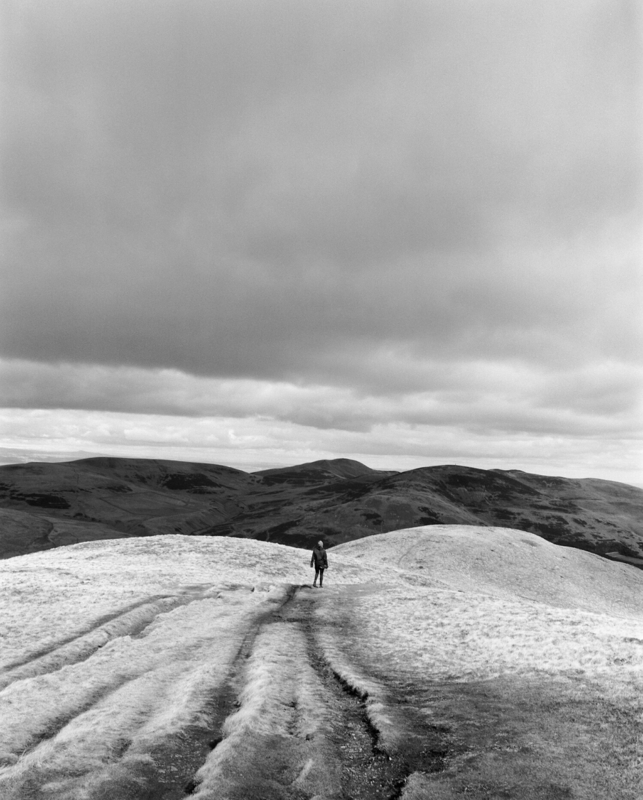 Delta 400 seems like a nice film and did a lovely job of showing the sections of light and shade painting the hills of The Pentlands. The next couple of shots are taken with my Olympus Trip 35 since I needed to finish the roll from the previous day. Such a great little camera. A few months back Craig and I went a little trek through Saltoun Woods. The weather was all over the place, bright sun, heavy rain and the odd sun shower. As a result I didn't want to take any of my more expensive cameras so I brought along my trusty Canon AE-1 Program and my untested Olympus Trip 35. Probably not my best day of shooting but I think I still got some decent images, so hopefully you like them. 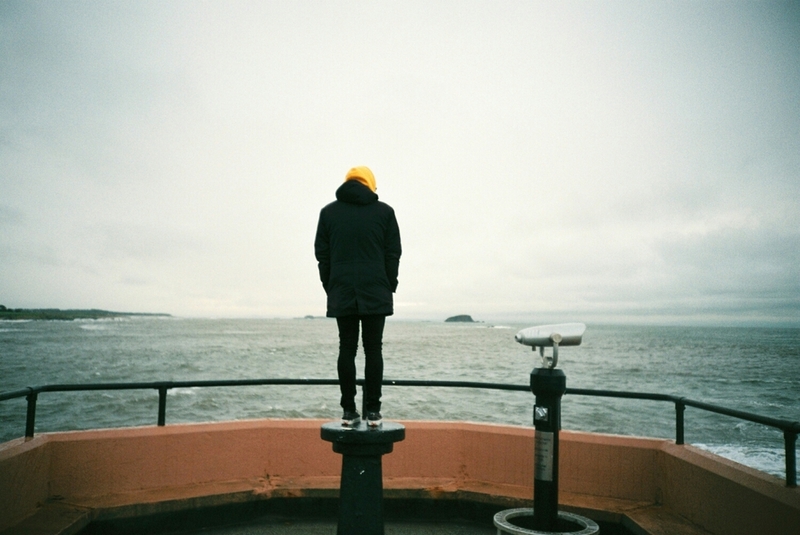 Naturally, due to the nature of film, you are always a little bit behind when it comes to the sharing of your images. Recently though, I've fallen way behind with my blog posts and as such I'll likely post quite a few in quick succession to catch up. 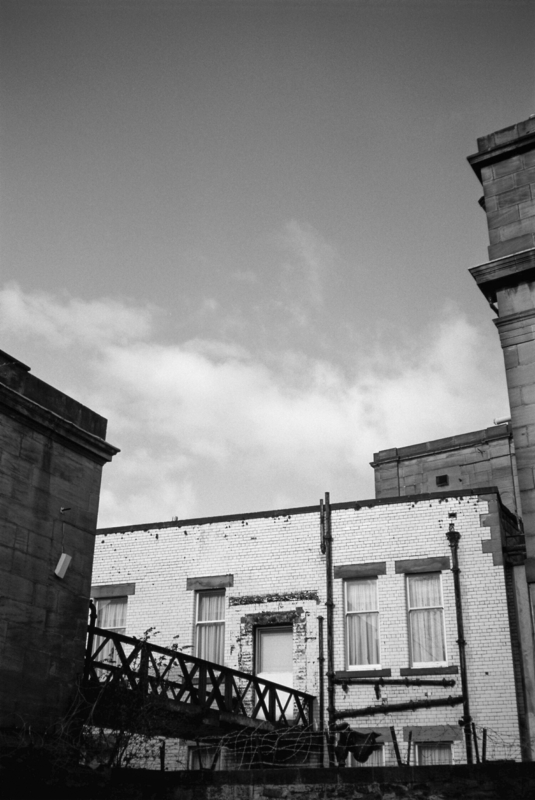 These pictures are from when I went out a drive to test my newly acquired (well it was in March) Mamiya 7ii. It's a camera I'd always wanted and I managed to get it for an absolute steal. Anyway, here's a handful of the test shots that I took that day. 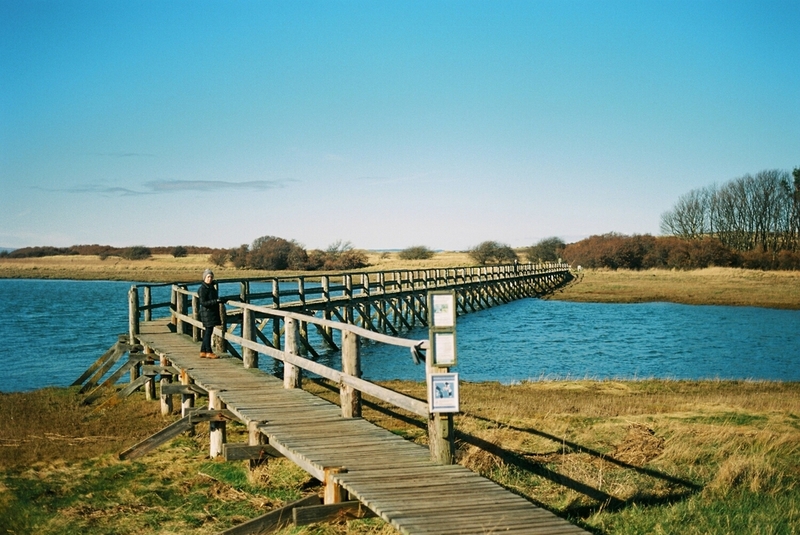 These images are from another trip along to Aberlady, but this time we walked in the town itself. It really is a lovely little place with such beautiful homes. You never want anything to go wrong with your film or camera but on the rare occasion it does it can produce some wonderful results. This next series of images are from the same day as a previous set (Calton Hill) but from a different camera, my Yashica Electro 35 GT. About halfway through the roll I felt something go wrong but kept shooting anyways. 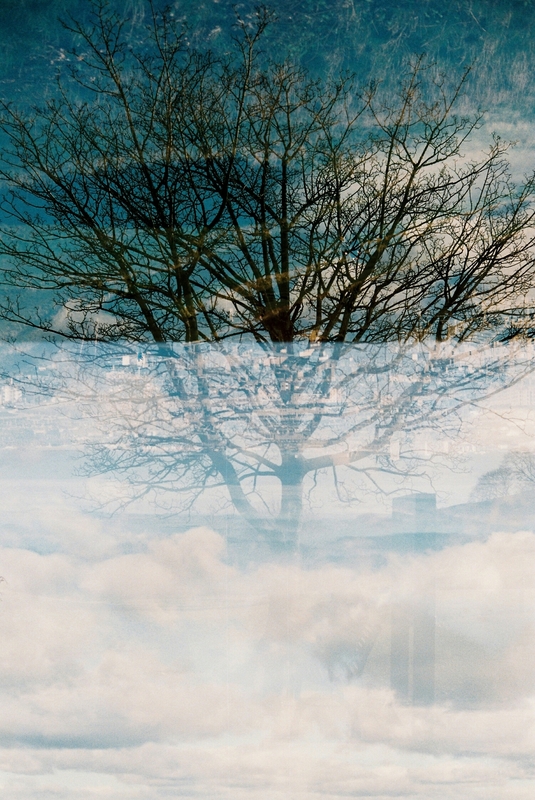 Turns out the film wasn't advancing properly so the frames ended up overlapping in really interesting ways. These are the happy accidents that were produced. I think they look really cool. This next series of images are from when my Mum and I went for an afternoon walk along Aberlady Bay. 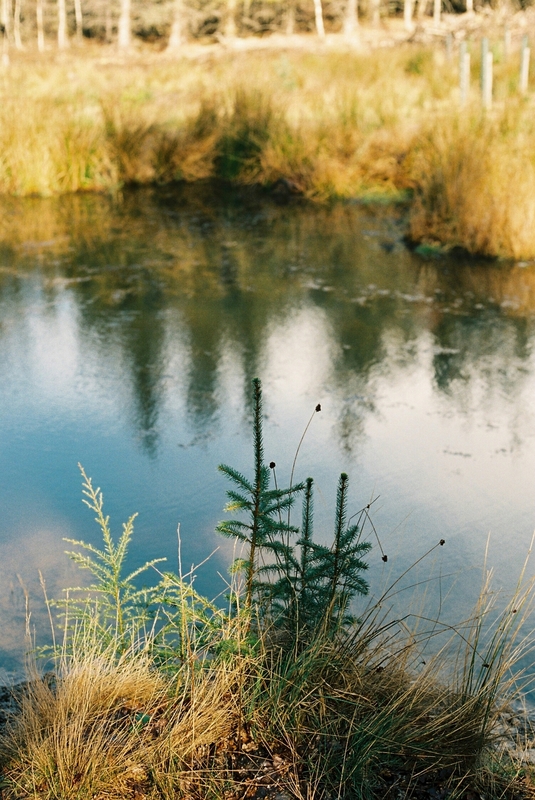 In 1952 it became the UK's first Local Nature Reserve. All images were taken with my Contax G2 and Kodak Ektar 100 except for the last two which were taken with my Konica Pop and Fujicolor C200. Loved the way the shadows fell on the bridge. Beautiful view on what was a beautiful day. 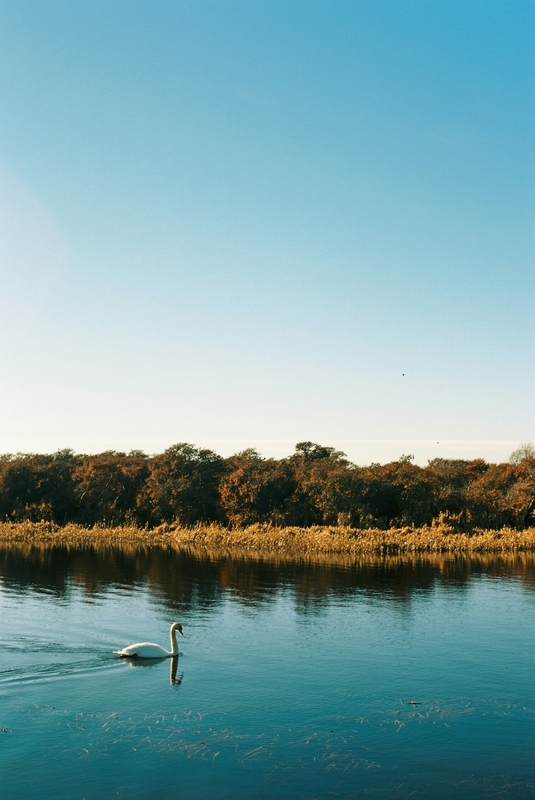 I feel this one really shows how great a film stock Ektar is, such great colours. Been trying my hand at shooting some minimal stuff here and there. I feel like my eye for seeing those kind of compositions out in the world is improving. Another minimal landscape. I love shots like this. To finish off this set of pictures from Aberlady Bay I'm going to post a couple from a quick test roll I shot on my Konica Pop. The Konica Pop is about as "point and shoot" as they come with fixed focus and exposure. The pictures it produces tend to have a lovely soft, lo-fi look to them. Back in March I went to visit Adam and Emily to see their new cat Peco. I thought it would be a good idea to test some faster speed films handheld in dim light so I brought along my Contax T2 loaded with Delta 3200 and my Contax G2 with Cinestill 800T (pushed to 1600). 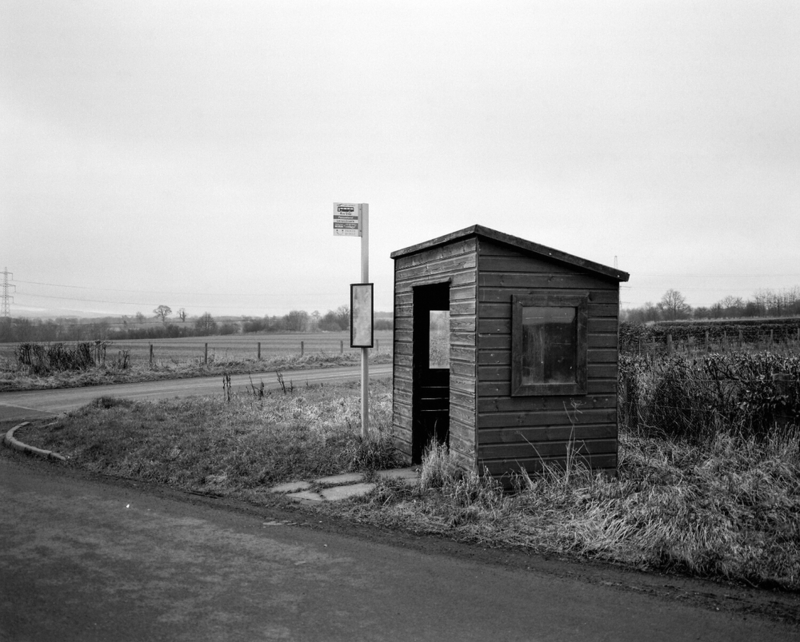 At the time I didn't realise Delta 3200's true speed was 1000 so I shot it at box speed but despite that fact, I think they turned out really well. Sure, they are grainy but I think it's a pleasant grain. The pictures are mostly snapshots so don't expect my best work, but with that being said, I think I managed to get some really nice ones of Peco and his humans. As you may have noticed the Cinestill shots have some purple spots/blotches in them which is something that can happen, apparently. Despite that though, I thought it did a lovely job and produced a unique look, especially with the shots of Adam and Emily in the bathroom. Following our little jaunt up Calton Hill, my Mum, Dad, Auntie and I went a walk around the outskirts of the city centre. 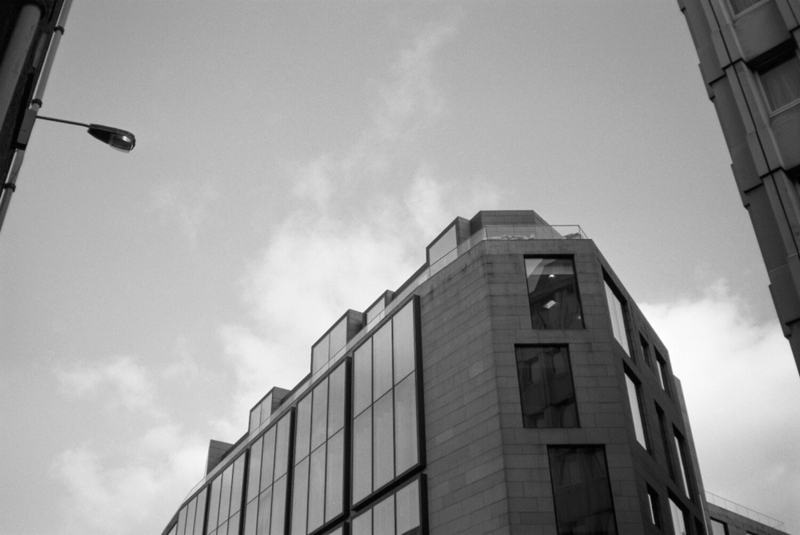 I felt this was a good opportunity to load my Contax T2 with Kodak's T-Max 100 and try to shoot some street photography/architectural stuff. T-Max is a black and white film that I was really looking forward to trying and I'm glad to say it delivered. Possibly my favourite black and white film I've used thus far. 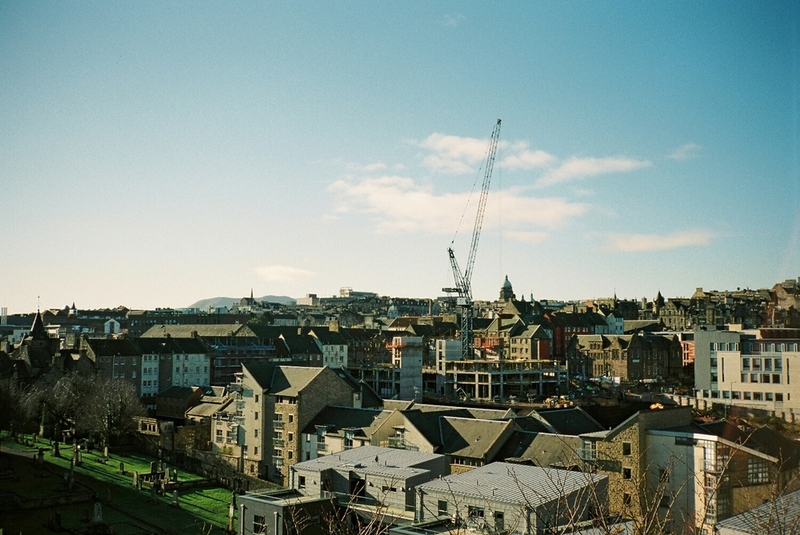 These images were all taken on and around Calton Hill using my Contax T2 and Fuji 400H. My Mum, Dad, Auntie and I went up early one morning for a walk and the light was particularly beautiful that day. First up is an image of The Burns Monument on Regent Road at the foot of Calton Hill, the foundations of which were laid in 1831. The monument was built to house a white marble statue of Robert Burns and it did so until the statue was moved to the Scottish National Portrait Gallery due to smoke from the gasworks below affecting the marble. The Old Royal High School, also known as New Parliament House, is a 19th century neoclassical building on Calton Hill which, despite its name, isn't home to the Scottish Parliament. A proposal in the 1970s for it to house a devolved Scottish Assembly fell through as the 1979 devolution referendum failed to provide sufficient backing for a devolved assembly. Since then the building has been used for various things such as a place for meetings for the Scottish Grand Committee and as offices for departments of Edinburgh City Council. In December 2015 plans to turn it into a luxury hotel were rejected by the council. The view from Regent Road. A closer look at the impressive architecture of the Old Royal High School. Waverley Station and the North Bridge. St Andrew's House, the headquarters of the Scottish Government. The top of The Nelson Monument peeking over the nearby greenery. It seems that people rarely take a picture of just the Dugald Stewart Monument on its own, it's almost always accompanied with the Edinburgh skyline in the background. For me, I wanted to focus on it along with the subtleties of its surroundings such as the lone tree, the green poles and the shadows on the paths in the foreground. Old Observatory House on Calton Hill. Some others enjoying an early morning walk. Construction of The National Monument was started in 1826 but was abandoned in 1829 due to lack of funds. It was modelled upon the Parthenon in Athens and is a memorial to those who lost their lives during the Napoleonic Wars. 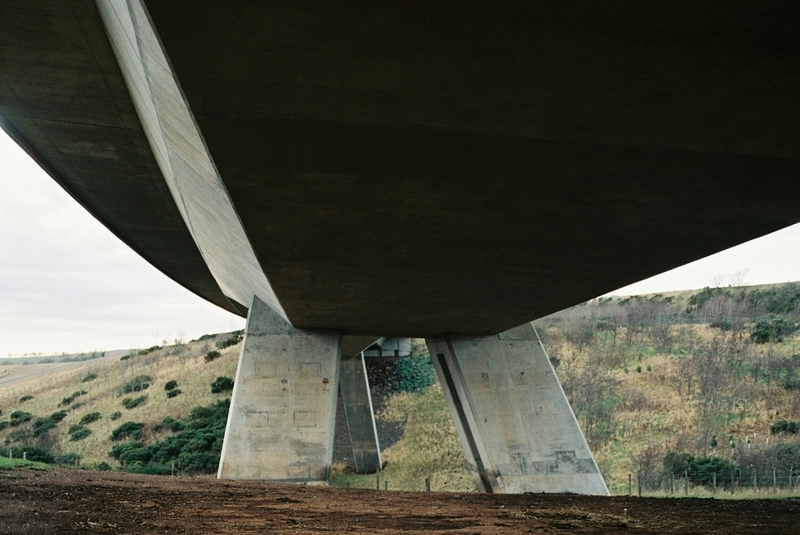 It's an impressive structure but that's not why I like this photo, let me explain why I do. 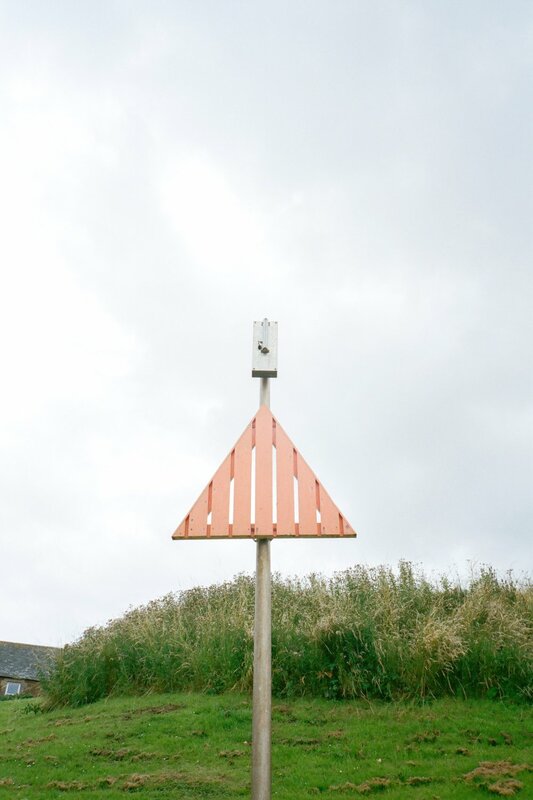 Triangles are a big compositional tool in photography, and whilst I'm not going to go into the details of why (I'm not qualified/knowledgeable/talented enough to do so), they are something I notice quite often in my own work, sometimes after the fact. Which brings me to what attracted me to this picture, the people, particularly the spacing of them. For example the space between white trousers person, monument person and red top person. Or the space between monument person, red top person and the person to the left of the lamp post. Both of these examples also create triangles. I don't have a reason for why I find this visually pleasing, I just do. Another feature I found pleasing was the juxtaposition between the two people at the monument and the two people either side of them. One of the people at the monument is taking a picture of the other, there is a relationship between them, whereas white trousers person and red top person are heading in completely different directions and appear to be singular with no relationship between them. Now, I'm certainly not claiming that I saw all of these things at the time of taking the photograph, I was only aware of the pleasing spacing between the people and, in terms of timing, trying to make sure the two people on the right didn't intersect with the lamp post, but I think noticing visual features that you like afterwards is important because it gives you more insight into what kind of things you like to see in your photographs and also teaches you to look out for these things when taking photographs in the future. Hopefully that wasn't too boring of an insight and apologies if it was too convoluted. This is the Nelson Monument, built in honour of Horatio Nelson. 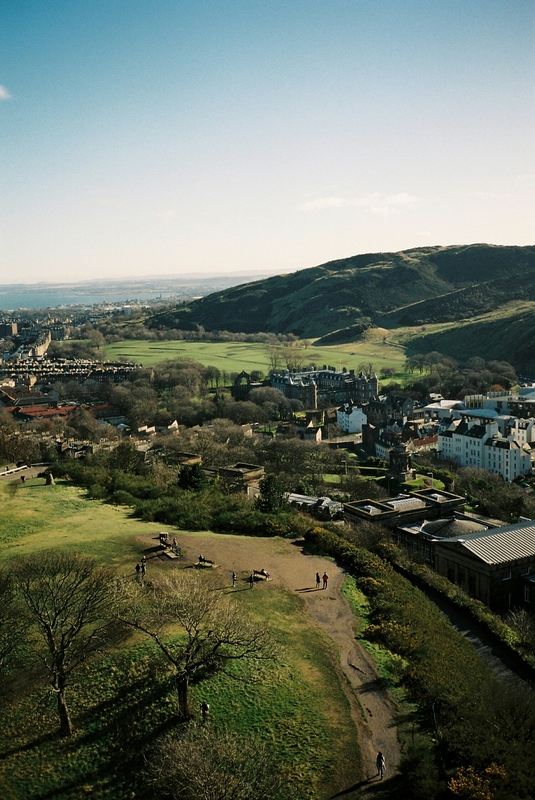 For £5 you can climb the spiral staircase all the way to the top and see some incredible views of Edinburgh. The Scottish Parliament, Holyrood Palace. 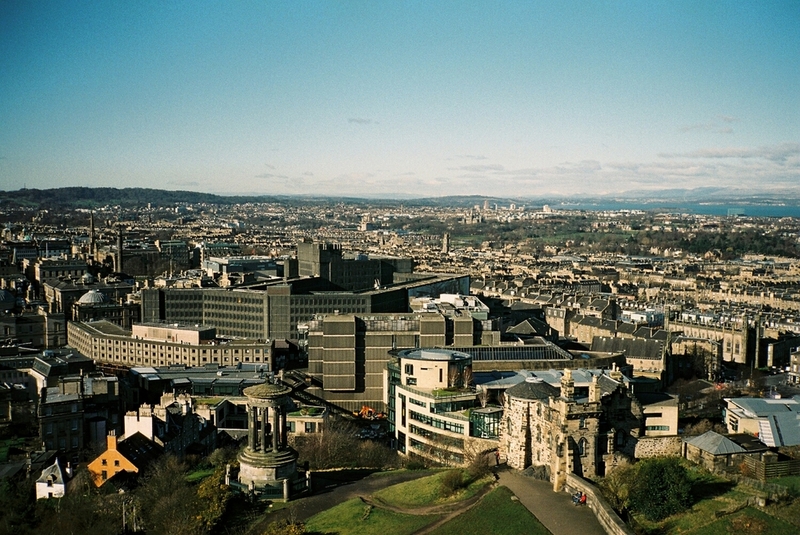 Dynamic Earth, The Crags and Arthur's Seat viewed from the top of The Nelson Monument. Film captures light like this so beautifully. Edinburgh Castle, Princes Street, Waverley Station and the North Bridge from The Nelson Monument. Not the most unique image I'll ever take but I'm happy with my version of it. A lovely view of the City Observatory. 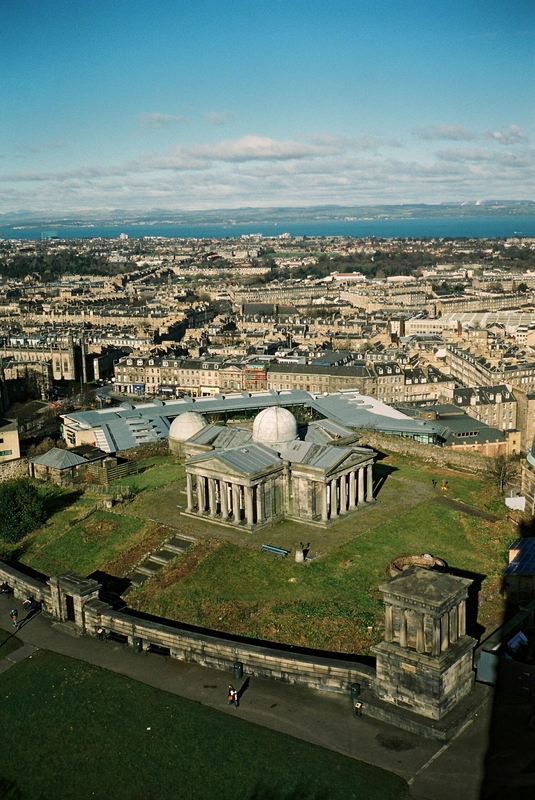 In 2009 the Astronomical Society of Edinburgh moved out of the Observatory and the buildings reverted to the City of Edinburgh Council. In 2012 the Council started redeveloping the complex in partnership with the Collective Gallery who relocated from their old premises in 2014. Today they run exhibitions in The City Dome and they aim to finish redeveloping the rest of the site and have it fully open to the public in 2017. Another Edinburgh cityscape. I love the orange house down the bottom left. This is my final image from up at Calton Hill and I think it might be my favourite. Like I mentioned with my photo of the National Monument, the placement of the people and the triangles they create really stood out to me. Specifically the couple admiring the view, the girl emerging from the shadows at the bottom of the path and the person under the tree. That was my focus with this one because, quite frankly, the view takes care of itself. A few weeks ago on a lovely, bright Scottish morning my Auntie and I climbed to the top of Berwick Law. I just received my scans back from that day and I'm really happy with how they've turned out. They are a mix of Portra 400 shot using my Mamiya 645 Pro and Ektar 100 with my Contax T2. It was my first time shooting medium format and also my first using these cameras and film stocks. I'm really loving the results. Anyway, here's the first picture. It's probably the weakest of the bunch but I liked the way the sun glistened off this pool of water, sort of looks like an infinity pool. On the north side, just before you reach the summit, lies the ruin of a watch-house from the Napoleonic Wars. Soldiers situated here would light a fire whenever they saw French ships trying to enter the Firth of Forth. The Law has a long history of being used as a lookout. The views from the summit, especially on a morning like this one, are beautiful. 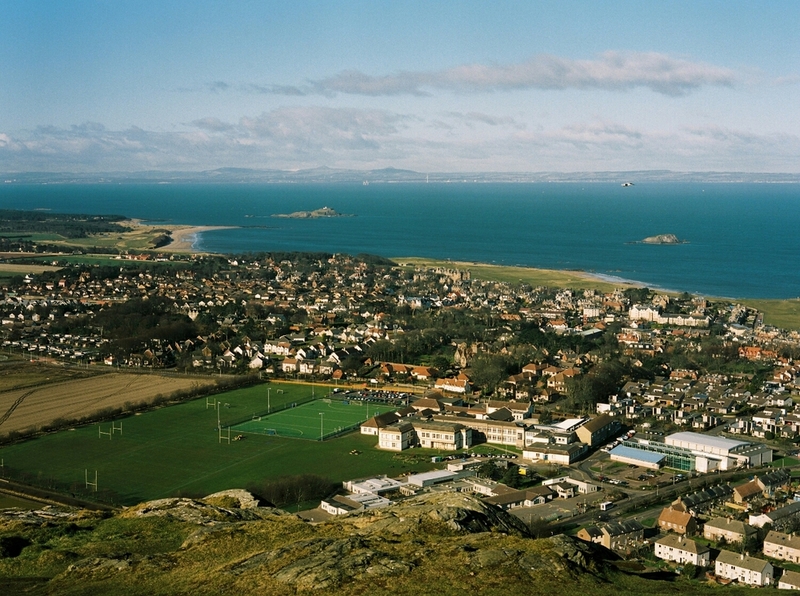 This image shows the majority of North Berwick and its lovely coastline. The island to the left is named Fidra (from the Norse for "feather island"), and it is claimed that Robert Louis Stevenson based his map of "Treasure Island" on it. A similar claim is made about Unst in Shetland. I guess we'll never know for sure, but what we do know is that he mentioned Fidra in his book "Catriona" and often spent time on the beaches which overlook the island. The smaller island to the right is known as The Lamb and is flanked by two skerries (a skerry is a small rocky island too small for habitation), and they are referred to as North and South Dog respectively. Bizarrely, it was bought by serial cutlery destroyer Uri Geller in 2009 because he believed it contained ancient Egyptian treasure. 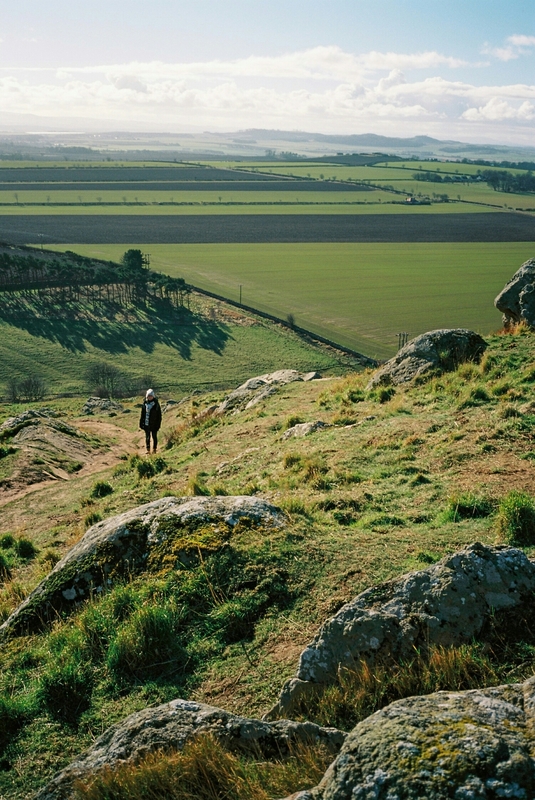 There are four islands off the coast of North Berwick, two of which I talked about already. Collectively they are known as the East Lothian Emeralds. The third island in the chain of four is called Craigleith. 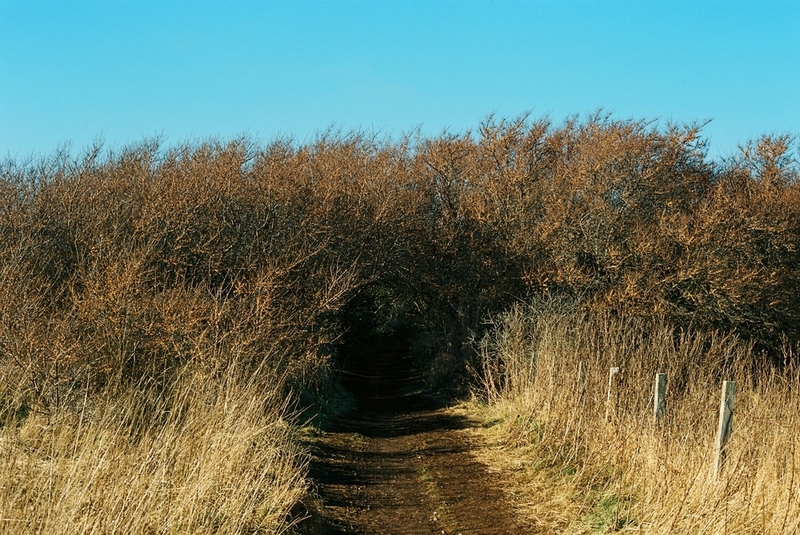 It was once a rabbit warren, which is a series of connected underground tunnels occupied by rabbits, until myxomatosis wiped out the population in the 1950s. Apparently, rabbits have since been spotted there after being mysteriously reintroduced. One of the things I tried to capture with these images is the man-made patterns of the residential areas and I think this one in particular showcases that well. My eyes always seem to be drawn to curves and in this instance they were drawn to how the houses curve round gently and lead the eye towards the Bass Rock. Bass Rock is the fourth and final island off the coast of North Berwick. On the island you'll find the ruins of both a castle and a chapel, a lighthouse, and roughly 150,000 gannets. It is the largest single rock gannetry in the world and that very fact is the reason why large parts of the rock look white from a distance. Its lighthouse was constructed by David Stevenson, cousin of author Robert Louis Stevenson. The Bass has a rich history for such a small island and has been used as a prison at various different times. The history books also say that the first inhabitant of the island was a Christian hermit named Baldred who died around 606 AD. A fact that I find hard to get my head around. 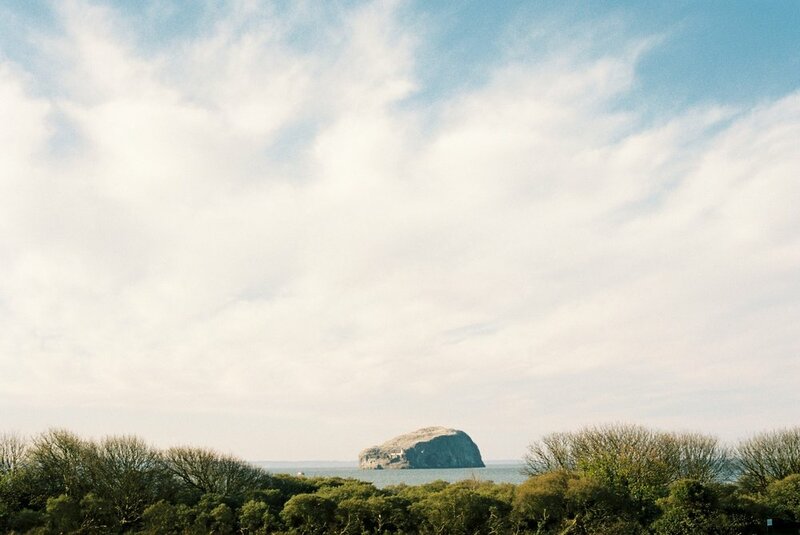 A nice shot of my Auntie looking out to the Bass Rock. I wasn't sure whether or not I should post this one but I wanted to show a view from the summit facing south. In person the way the light was hitting off the perfectly cut straight lines of farmland was stunning but I'm not sure I managed to capture that. Also, due to somewhat limited space (falling to my death didn't really appeal to me) I struggled to get the framing the way I wanted. On the way back down I swapped my Mamiya 645 for my Contax T2 loaded with Ektar. The first shot I took was of this rather nicely placed bench that's just over halfway up the Law. A few seconds after I took this picture of my Auntie I lost my footing and duly rolled down the next part of the hill. My falling technique solely revolved around not smashing my Contax T2 off the ground after only taking two pictures with it, and luckily, I succeeded! 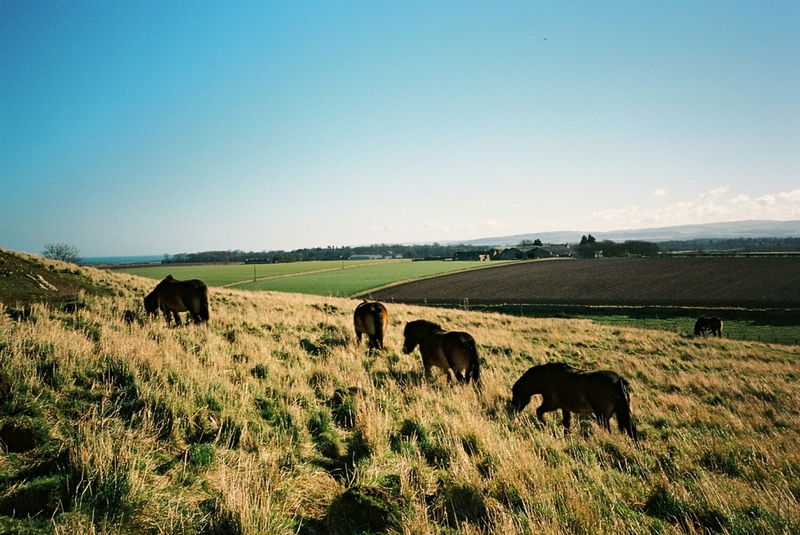 On our way back down we spotted the string of wild Exmoor ponies that graze on and around Berwick Law. I didn't count at the time but I've since read that there are seven of them and they are named Sherlock, Clouseau, Morse, Inspector Gadget, Artemis, Rebel and Oberon, respectively. They were brought to the area as part of a conservation grazing effort to help deal with the overgrowth of coarse grasses and gorse. 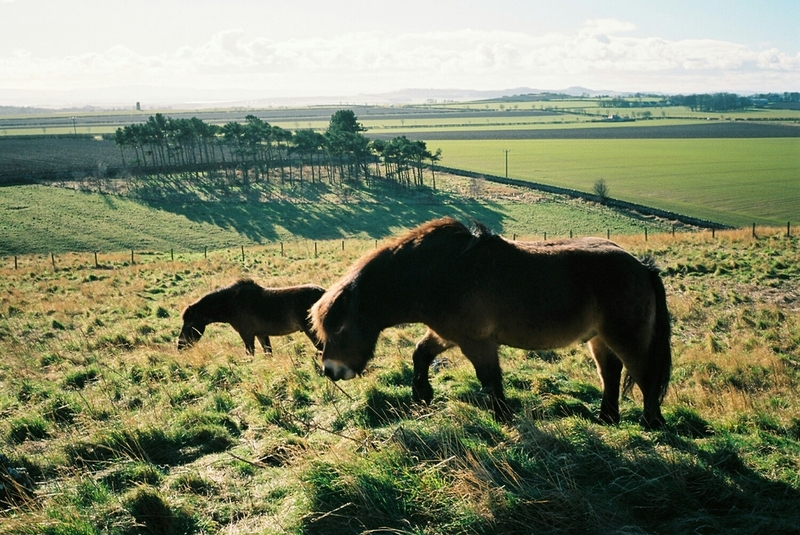 Exmoor ponies nearly became extinct after the second world war due to soldiers using them for target practice and some people killing them for their meat. At one point only 50 registered mares and 4 stallions remained but luckily they managed to recover and as of 2010 there were an estimated 800 Exmoor ponies worldwide. And just like that they were on their way. I'd like to go back and dedicate some time solely to photographing them as I think I can do much better, but it was still a nice surprise having them wander by. Managed to take a picture of my Auntie just as she walked through this little tree archway. Love the forest green of the trees in the distance. 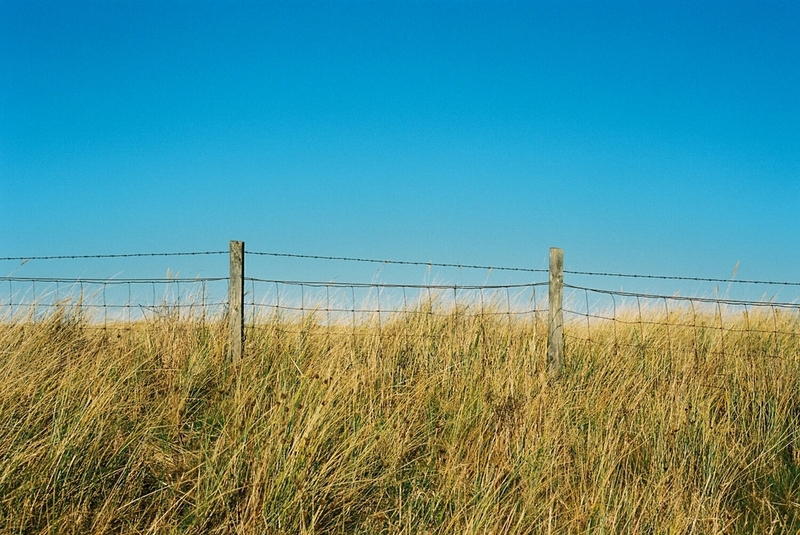 I quite enjoy minimal landscapes like this one. 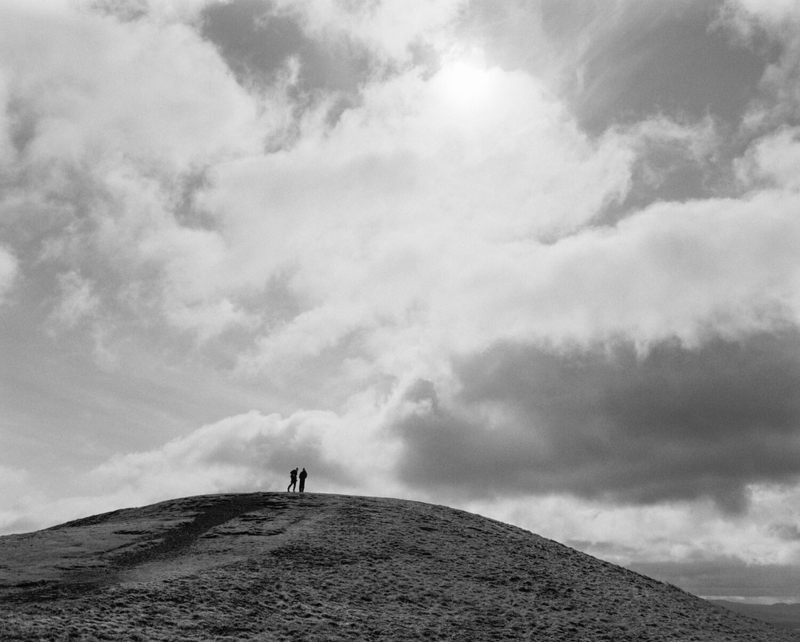 This is the last photo from my Berwick Law set and possibly one of my favourites from the day. 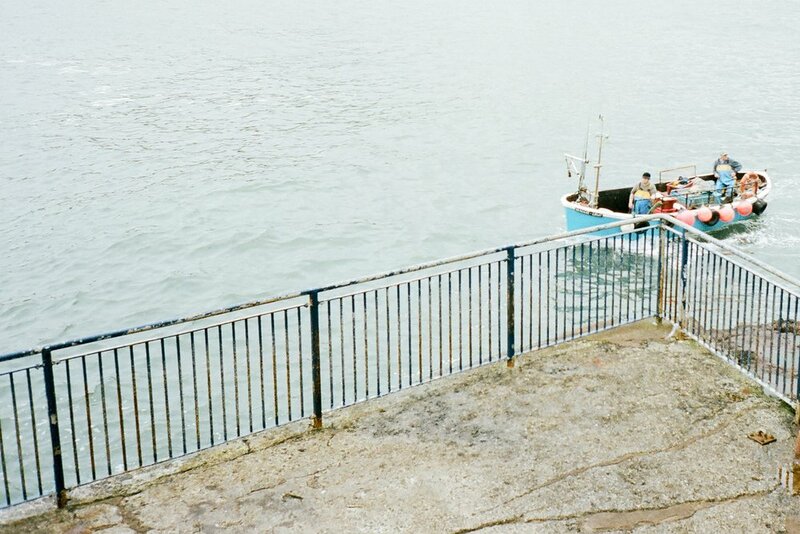 It is exactly the image I saw in my head and it really shows what a spectacular camera the Contax T2 is. Speaking of which, aside from this shot and a couple of others, I don't think I did the camera justice. After using the Mamiya 645 at the summit my mind was still in that mode so I ended up metering for nearby shadows with the Contax by half pressing the shutter totally forgetting that doing so locks the focus. I think shooting at f8 saved me a bit but it wasn't ideal. The good thing about making dumb mistakes like these are that you feel like such an idiot afterwards that you won't ever make them again. 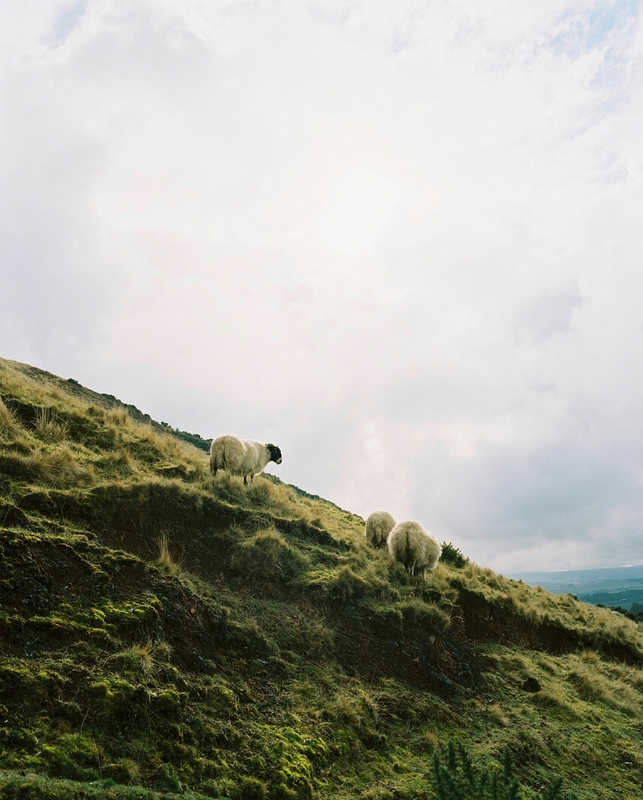 My next blog showcases the Contax T2 way better and I'm looking forward to sharing it. 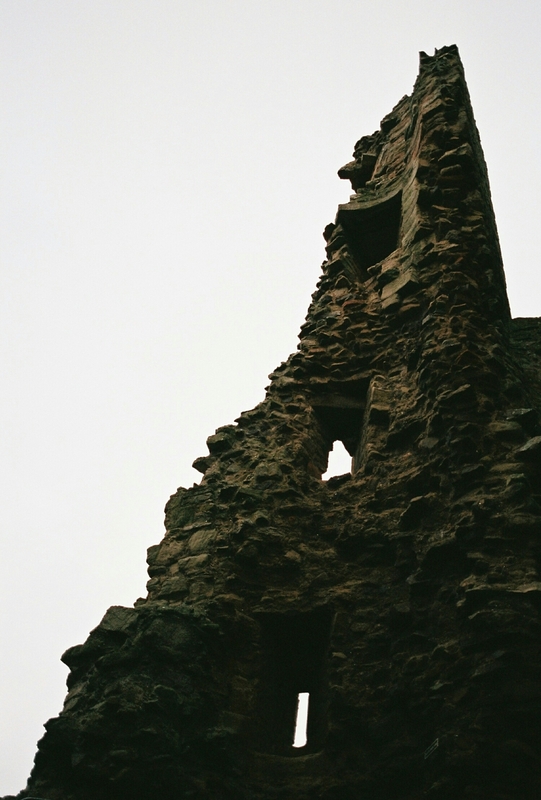 A few weeks ago I wanted to test my new Contax G2 so I went to Hailes Castle with my Mum. It was really nice to go out somewhere with her as it's not something we really get to do and Hailes Castle was on my growing list of places I wanted to go visit. East Lothian, the county where I live, has a huge amount of castle ruins strewn across its land and I'd like to visit as many as I can. With so much history right there on my doorstep, it seems foolish not to. 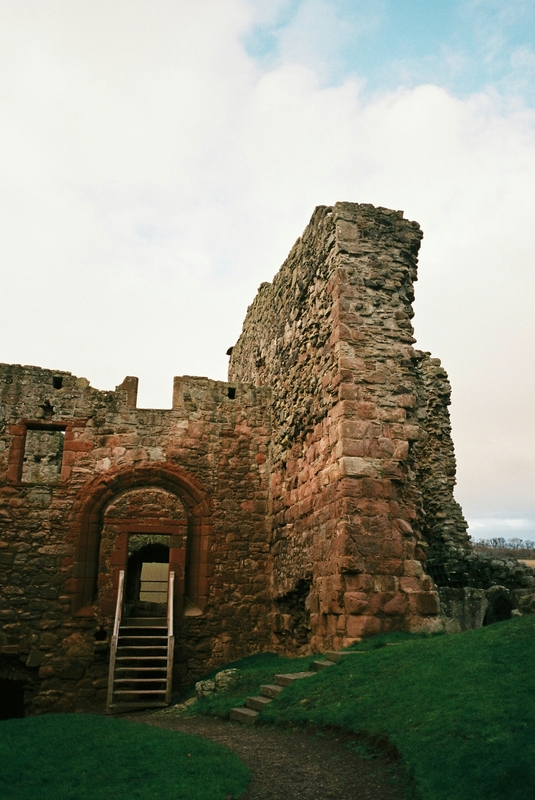 Hailes is one of Scotland's oldest stone castles and was built around the year 1220. It sits in the valley of the River Tyne about a mile and a half from the town of East Linton. I shot two rolls of film, one roll of Fuji Superia X-Tra 400 rated at 200, and one roll of Fuji C200 at box speed. As for lenses I used both the Zeiss 28mm f2.8 and the 45mm f2. Extremely happy with the Contax G2 system and I can't wait to use it again. Hopefully you enjoy the pictures. Hailes Castle was built by the de Gourlay family and remained under their ownership until they forfeited it during the Wars of Independence with England. The castle was then granted to Sir Adam de Hepburn by Robert the Bruce. The last Hepburn to hold the castle was James Hepburn. James was believed to have been involved in the murder of Mary, Queen of Scots’ second husband, Lord Darnley. In April of 1567 Mary was abducted by Hepburn and taken to Dunbar Castle. They then travelled to Hailes Castle, where they stayed overnight, before proceeding to Edinburgh to be married. It was this event that would eventually lead to Mary’s ruin, and years later, her execution. What remains of the East tower along with the tree that's sprouted up behind it. My Mum having a wee seat in the castle grounds. 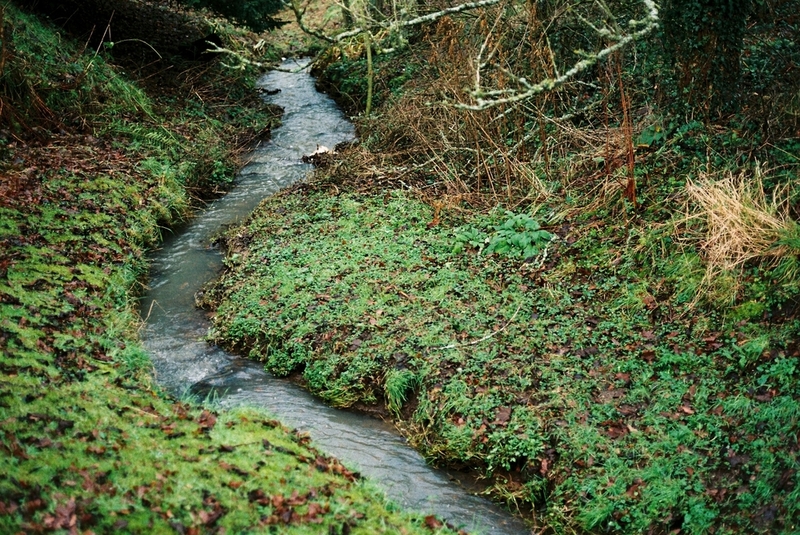 Old Hailes Burn is a tiny tributary that runs along the front and side of Hailes Castle and into the River Tyne. The distinctive red sandstone masonry makes it easy to identify the original castle from the parts that were added to it later. My Mum walking through the remnants of the Castle's curtain wall. A mishmash of rocky patterns. 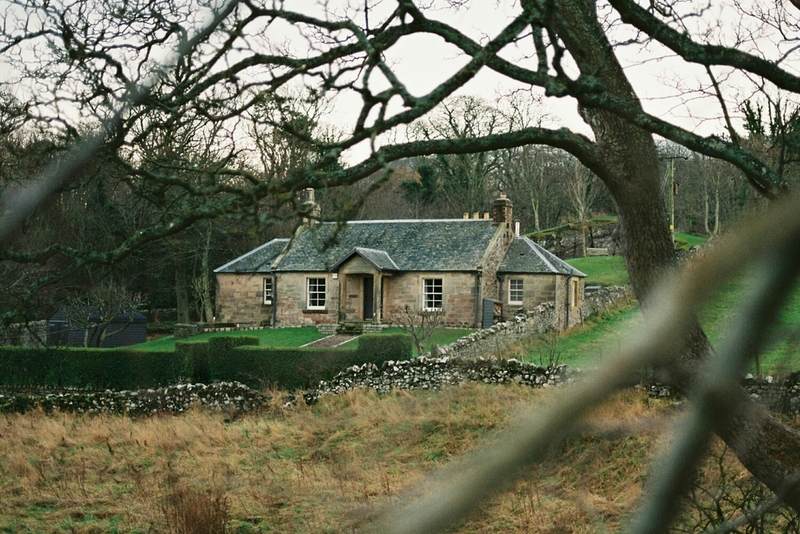 A cottage that overlooks a castle? I think I'd be OK with that. 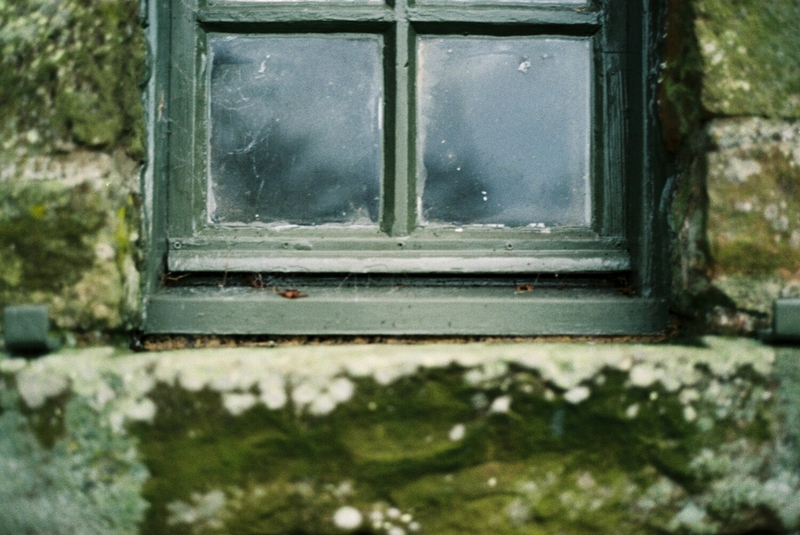 There's a little maintenance building within the castle grounds and I couldn't help but be drawn to the shades of green, particularly the olive green of the bricks surrounding the window frame. This is one of those photos that I think people might find utterly boring, but personally I find nature's colours and textures to be anything but. I accidentally exposed for the highlights with this one so it looks different to the other castle shots but I'm posting it anyway because I quite like it! A closer look at the lovely cottage just across from the castle. This one might drive symmetry buffs mental but I liked the hedges. 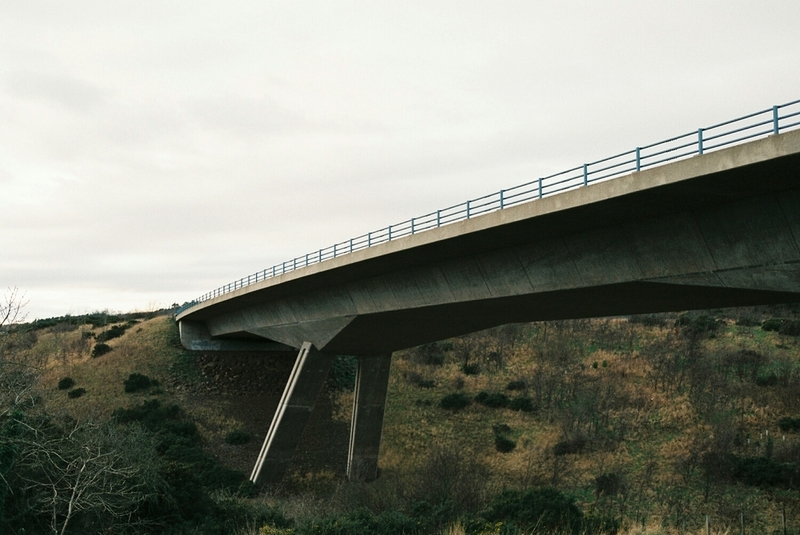 We passed this amazing bridge on our way to Hailes Castle, so on the way back home I quickly jumped out the car and took a handful of pictures of it. 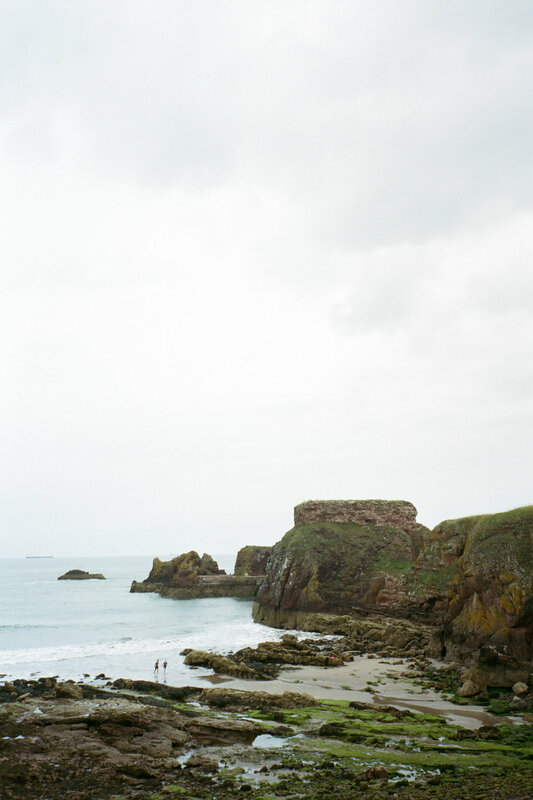 Received my scans back from the lovely folks at UK Film Lab after only 3 working days. Truly excellent service. Wasn't supposed to have them until this month so it was a really nice surprise! 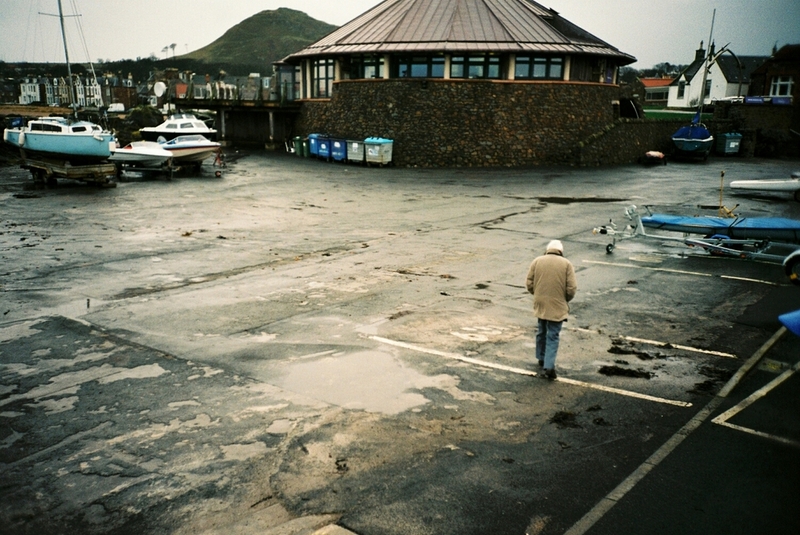 The first shots I'll be sharing are from a blustery, wet Sunday my friend Craig and I spent in North Berwick. 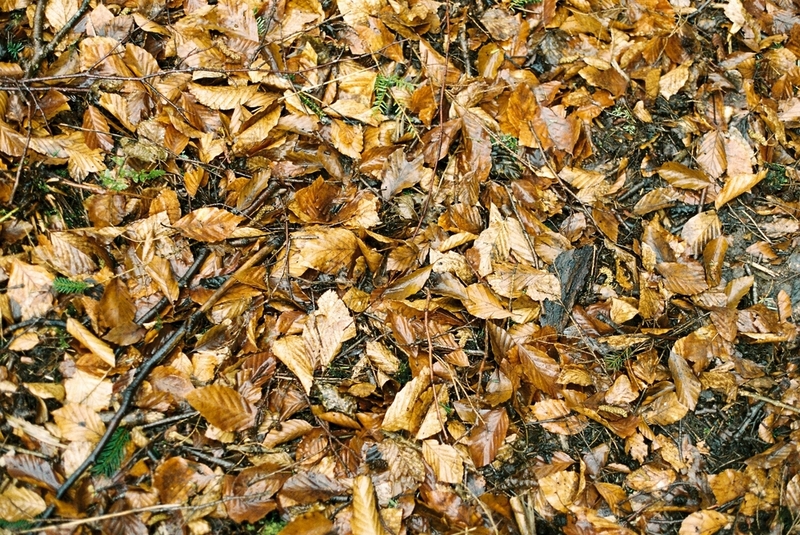 I had intended on testing my Contax T2 but I didn't feel comfortable taking it out in the light rain. 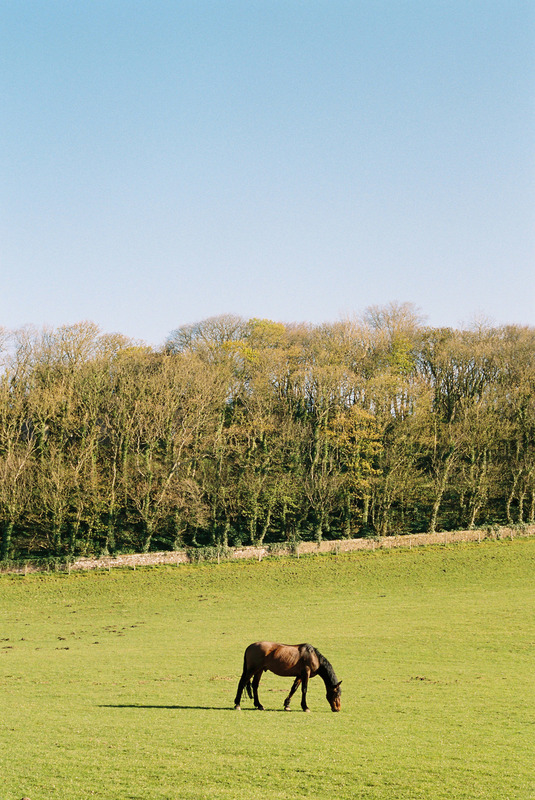 Instead, I decided to take my much less expensive Lomo LC-A to test and I thoroughly enjoyed using it. I wasn't sure what to expect from my compositions since the viewfinder is a bit weird due to the frame lines being partially obscured. No idea if that's the case with all LC-As or if it's just mine. Either way I worked with what I had and I'm happy that, for the most part, they were accurate. It was also my first time using a camera with zone focusing which was cool and I did a lot better than I expected. 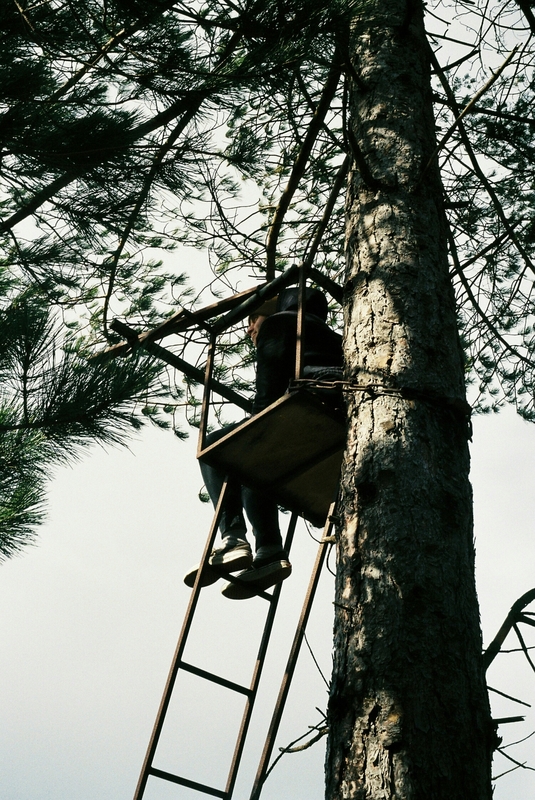 All shots were shot using Fuji Superia X-Tra 400 at box speed. This first image was taken from the car on our way to North Berwick, at a set of traffic lights in Haddington to be precise. I liked the way the windscreen fog and the dashboard framed the man crossing the road. The coast is beautiful when it's sunny, but I also find the same to be true when the weather is the complete opposite. A different colour palette, a different tone, a different feel. 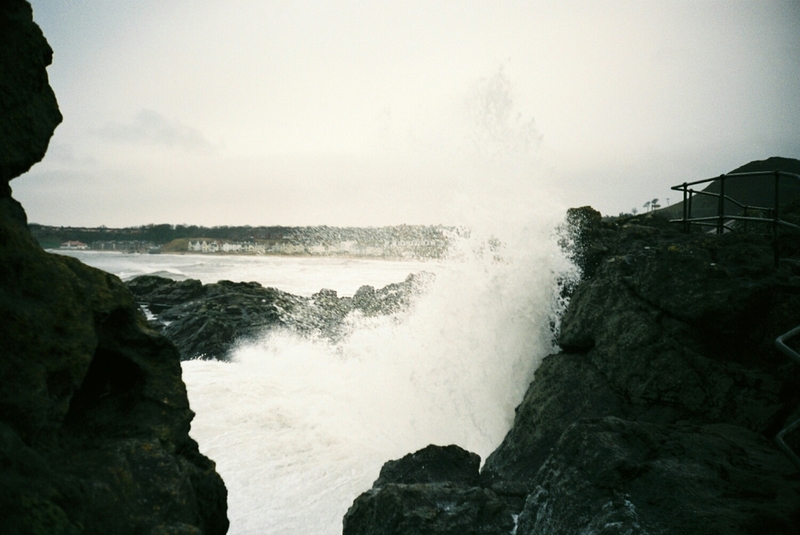 For me adverse weather conditions have always served as a strong reminder of just how alive the world is and that was very much on display in North Berwick with the sea hammering against the rocks causing the water to shoot high into the air. It was really cool to watch and I'm glad I managed to capture a little bit of that. It was nice to see so many people out and about exploring the coastline despite the wind and rain. Craig looking out to sea. I'm not sure if it's still in use but this little coastguard lookout hut sits on the rocks watching over the sea nevertheless. These colourful doors were once changing rooms for North Berwick's outdoor swimming pool. Sadly, the pool is no longer there, it's now used to park boats not in use, but the rainbow coloured doors remain. This elderly gentleman was having a stroll along the harbour just in front of Craig and I. He was only in our view for a minute or two at most and my decision to take the shot when I did happened in a split second. However, the moments beforehand play a big part in why it's one of my favourites from that day. Let me explain. "The Dictionary of Obscure Sorrows" by John Koenig is a project that aims to come up with new words for emotions that currently have none. One of the words in the project is "sonder" which he describes as "the realization that each random passerby is living a life as vivid and complex as your own". I mention this because I've done this for as long as I can remember and I did so with the man in this picture. I wondered if he was lonely, if he'd lost the love of his life and walks this path because it's something they used to do together. Or maybe it's something that brings him great joy and his significant other awaits cosy in their little seaside home. The possibilities are endless and in truth I find it overwhelming because I feel every bit of emotion contained within the life I've constructed for the person. I may not have seen his face but his slightly hunched, closed posture, pictured above, felt vulnerable to me and made me wonder what he was feeling, and I guess that's why I like this photo so much. It's just a man out on a walk, but that man has a story. We all do. I loved the contrast between the dull, dark buildings in the foreground and the bright, colourful little houses in the back. Marine Parade is home to some stunning shorefront houses. This charming property really stood out to me. Another lovely property on Marine Parade. 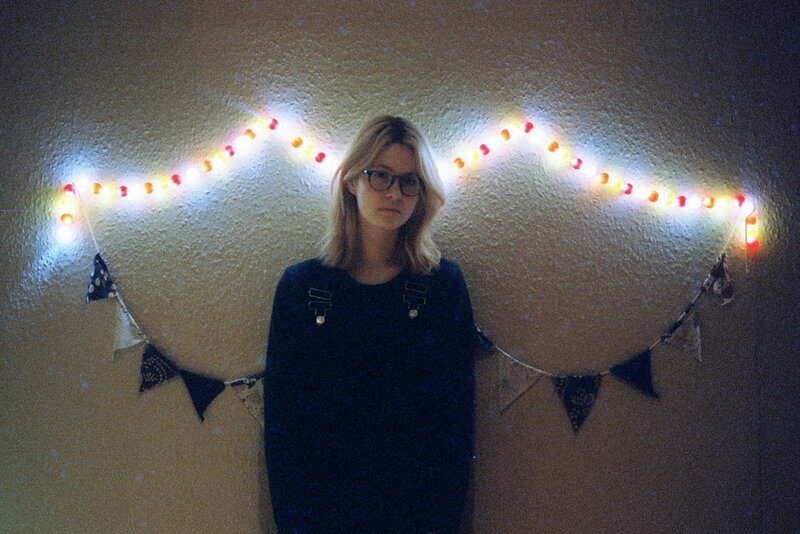 This is another favourite of mine from this roll. Turned out exactly as I wanted. The dark colours of rock formations always stand out to me on grey days. The Lomo LC-A is a great little camera and I had a blast shooting with it. It's diminutive size means that it can be taken with you almost anywhere and also that it's very inconspicuous, which is nice if you don't want to draw attention to yourself with a big camera. As for the images produced by it, I love them! They have a lovely soft quality to them that I find hard to describe in any great detail but they are certainly of a more lo-fi, lomographic variety. 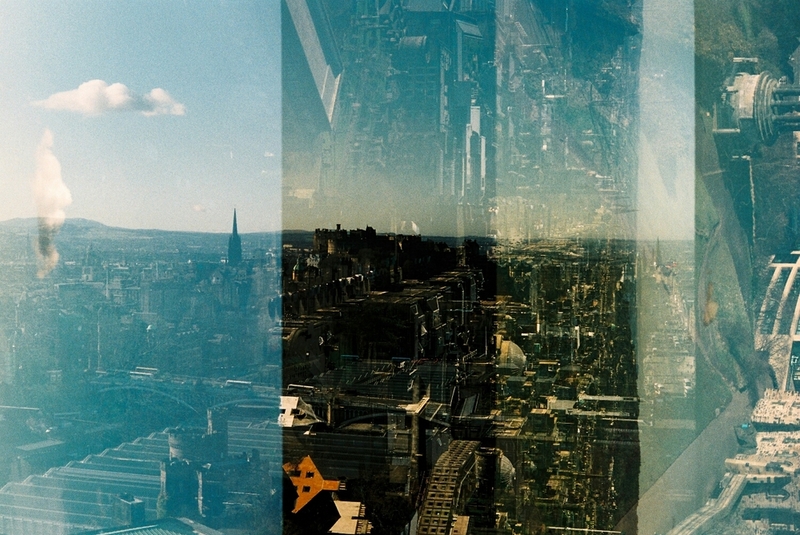 Speaking of lomography, the camera really changed my stupidly blinkered view of it. I had always seen it as cross-processed images with crazy colour casts and insane vignetting, which isn't my thing. Sure, you can cross-process your LC-A images to achieve that look if you so wish, and vignetting is present but it's much more subtle and that more subtle version of lomography is one I really like.